We know that Greenlink’s local and state revenues for transit fall far behind other peer communities in the Southeast. 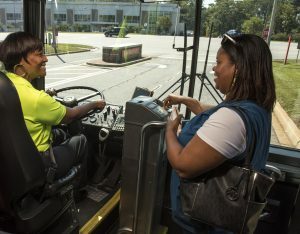 Because of this, Greenlink is using federal funds that are generally intended for capital expenses – such as replacement buses – to operate the system. This creates a double-whammy for Greenlink; the lack of capital dollars means they have not been able to purchase new vehicles or save money in a capital replacement fund. And the limited operational dollars mean the system is unable to expand to meet residents’ needs. Transit Director Gary Shepard recently presented to the Greenville County Council Committee of the Whole with a room packed with nonprofit organizations, health care providers, community-based organizations and businesses. Several council members noted that without increased funding, it will be impossible for the system to meet the community’s needs, ranging from connections to jobs, serving residents pushed out of the city by gentrification, alleviation of traffic congestion on major thoroughfares, and positioning the region for headquarters opportunities like that recently presented by Amazon. We are encouraged by the number of conversations around the importance of transit funding, and we look forward to discussion leading to a strong transit system for all.